People take part in an anti-China protest to mark the 43th anniversary of the China's occupation of the Paracel Islands in the South China Sea in Hanoi, Jan. 19, 2017. 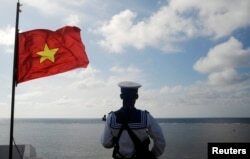 China's new construction on a remote South China Sea reef has soured its relations again with Vietnam, a claimant to the same islet, after a period of calm, and may also draw concern from the Philippines. Satellite imagery shows China recently installed a new “platform” at the otherwise largely undeveloped Bombay Reef in the Paracel Islands, a chain in the South China Sea, the Asia Maritime Transparency Initiative under the U.S. think tank Center for Strategic and International Studies says on its website. The Vietnamese foreign ministry protested this month against China’s work on Bombay Reef. It “demands China immediately halt and not repeat such actions…and make practical contributions to the development of friendship,” deputy ministry spokeswoman Nguyen Phuong Tra was quoted saying November 22. China and Vietnam, though Communist neighbors, have stood at odds over territory for centuries – most recently rival claims to the sea south of Hong Kong and east of the Gulf of Tonkin. China has effectively controlled the Paracel Islands since the 1970s despite Vietnam's claim to the same chain. 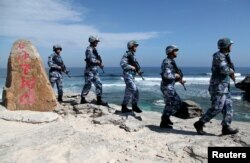 FILE - Soldiers of China's People's Liberation Army (PLA) Navy patrol at Woody Island, in the Paracel Archipelago in the South China Sea, Jan. 29, 2016. “The Chinese and the Vietnamese have been sort of in a tug of war over various maritime features, so I think we should see this as the latest in their series of tug of war,” said Oh Ei Sun, senior fellow with the Singapore Institute of International Affairs. Vietnam may worry that China will duplicate its construction work on Bombay Reef at other reefs and islets, further consolidating its control, maritime scholars say. “What is unique here is that we've never seen this type of quick, low-impact construction by the Chinese,” Asia Maritime Transparency Initiative director Gregory Poling said. The platform, possibly to be used for navigational aid, covers 124 square meters, his think tank says. Bombay Reef is about 9.5 nautical miles (17.6 kilometers) long and three nautical miles wide with a lagoon in the center, according to Asia Maritime Transparency Initiative data. An aging lighthouse was the reef’s only structure before the platform was built. China has built military installations and urban infrastructure elsewhere in the Paracels, which it said earlier this year it would open to tourism. Chinese officials are doing all that work to lock in its sovereignty claim, analysts have said. “From what we can see here, China’s done it before and for this to be one move in a bigger chain of actions, I guess we’ll have to see,” said Yun Sun, East Asia Program senior associate at the Washington D.C.-based Stimson Center think tank. China probably sees Bombay Reef itself as an “enhancement” of its development in the Paracel chain, said Jay Batongbacal, a University of the Philippines international maritime affairs professor. Vietnam and China have a history of testing each other’s patience at sea, especially as each side explores for gas in areas claimed by the other. When relations worsen, they often lower tensions by meeting first at the party-to-party level, then later between officials. ​Vessels from the two sides clashed because of that dispute in 1974, 1988 and 2014. In 2014 a Chinese offshore oil rig in contested water sparked violent anti-China protests in Vietnam. Sino-Vietnamese relations calmed after China apparently forced the cancellation of a joint undersea fuel exploration project between Vietnam and a Spanish contractor in March. Vietnamese President Nguyen Phu Trong, though not considered pro-China, will use party-to-party as well as state-to-state channels to work with China as needed, said Carl Thayer, professor emeritus with the University of New South Wales in Australia. Trong became president in October. The Philippines may be the next to confront China’s island expansion if Bombay Reef is an indicator, Poling said. China could apply the platform construction to the often-submerged Scarborough Shoal that’s northwest of Manila. “It could be replicated elsewhere like Scarborough without the expense and reputational damage of large-scale dredging,” he said. Beijing disputes tracts of the broader 3.5 million-square-kilometer South China Sea with the Philippines and two other Southeast Asian states. They all look to the sea as a source of fish, gas, oil and marine shipping lanes. China has tried to get along with the other countries since a 2016 world court ruling negated the legal basis for Beijing’s claims to the sea. Since then, Beijing has stuck to building up reefs and islets that it already holds rather than taking over new ones. Sino-Philippine relations have shown improvement since then, but China sees Scarborough Shoal as a prime fishery.